Sometimes a debtor’s rights in bankruptcy get affected by an overly aggressive Trustee. The Trustee gets a fee and a percentage of any assets administered. The debtor is seeking to keep any and all of his assets free and clear from the long arm of the Trustee. This blog today deals with the personal injury exemption and whether or not the Trustee can make claims to the debtor’s proceeds or potential proceeds from said injury. In general, the personal injury exemption of the bankruptcy code is a powerful tool. The Debtor is entitled to an exemption of $15,000 under Illinois law which is applied in a bankruptcy case. In addition, the spouse can use the exemption if her claim, such as loss of consortium, is derived from the bodily injury of her spouse. In my practice, I have a case where the spouse has a claim for negligent infliction of emotional distress after witnessing her husband injured during a festival event where severe weather caused tents to fall and injure attendees. The trustee objected to this personal injury exemption due to the fact that no bodily injury had come to her personally and she was not a dependent of her spouse. I will address each of these issues in turn. First, the trustee objected to the fact that the bodily injury was in fact her husband’s and not hers. 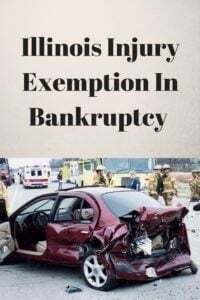 However, the Central District of Illinois Bankruptcy Court held, “a loss of consortium to be exempt because it is derived from the spouse’s personal bodily injury.” See, In re Dealey, 204 B.R. 17, 18 (Bankr. C.D. 1997). In the instant case, the negligent infliction of emotional distress occurred while witnessing horrific events, resulting in bodily injury to her husband. The injury was clearly derived from the bodily injury of her spouse. Had the husband not been injured at the festival, the spouse would not have had a claim for negligent infliction of emotional distress. Second, the trustee objected to the fact that the Debtor was not a dependent of her spouse. However, the Central District Bankruptcy Court has held, “Debtor is entitled to a personal bodily injury exemption for his medical malpractice claim arising from the death of his spouse because spouses are presumed to be mutually dependent. See In re Burns, No. 99-83458, 2000 WL 33950121, at *1 (Bankr. C.D. Ill. March 21, 2000). Exemption statutes should be liberally construed in favor of the debtor. If it is possible to construe an exemption statute in ways that are both favorable and unfavorable to the debtor, then the favorable method should be chosen. In re Barker, 768 F.2d 191, 196 (7th Cir. 1985); In re Jackson, 95 B.R. 590, 593 (Bankr. C.D. Ill. 1989). With the information cited above, I am extremely confident that the Judge will allow the debtor to protect her exemption over the Trustee’s objection. We will amend this blog entry as future events in court come to fruition.